Instant Pot 3-Ingredient Rump Roast–an easy beginner recipe for the Instant Pot. 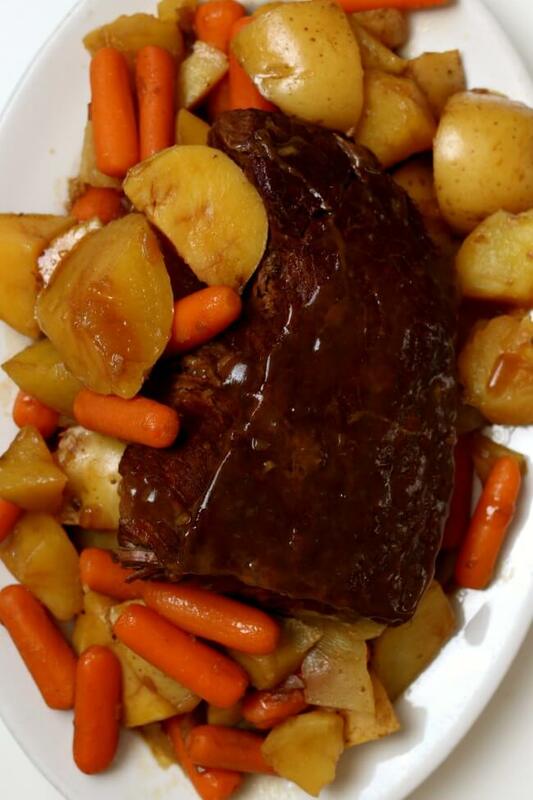 Beef pot roast is cooked until tender in the electric pressure cooker. If desired you can also make carrots and potatoes with the roast. This recipe was sent to me by a reader named Kathy. It’s a super easy recipe that you don’t have to spend much time putting together…dump and go! The rump roast does, however, take a while to get tender, even in the Instant Pot. I used a 90 minute pressure cooking time! That’s a long time for the Instant Pot. However, it takes a tough piece of meat and makes it fork tender. It doesn’t fall apart but it is easily shreddable or sliceable. The potatoes and carrots are an optional step. You add them in later and let them cook for only 4-5 minutes. If you tried to add them at the beginning they would be complete mush. The broth and drippings make an easy gravy. All you have to do is stir in a cornstarch slurry and let it thicken up. The roast rump doesn’t have much fat on it so there is not a lot of grease. Join me every Tuesday when I show you how to make a new Instant Pot recipe. Subscribe to my youtube channel! To make Instant Pot 3-Ingredient Rump Roast I used my 6 quart Instant Pot Duo 60 7 in 1*. I love this Instant Pot because it has the yogurt making function which I use almost weekly. It has two pressure settings (high and low), and there are also little slots in the handles so that you can rest the lid there instead of putting it down on your counter-top. An easy beginner recipe for the Instant Pot. Beef pot roast is cooked until tender in the electric pressure cooker. If desired you can also make carrots and potatoes with the roast. Place your trimmed roast in your Instant Pot. Pour in the water. Sprinkle the packet of onion soup mix over the roast. Sprinkle your packet of au jus gravy mix on top of the roast. Cover the pot and secure the lid. Make sure valve is set to sealing. Set the manual/pressure cook button to 90 minutes on high pressure. The pot will take about 10 minutes to build pressure and then will start counting down from 90. No potatoes and carrots option: Once the time is up let the pot sit there for another 15 minutes (display will read L0:15) and then move the valve to venting. Remove the lid. Potatoes and carrots option: Once the time is up move the valve to venting. Remove the lid. Add in the potatoes and carrots. Replace the lid and set the valve to sealing. Set the manual/pressure cook button to 4 minutes (for less soft vegetables) or 5 minutes (or softer vegetables). When the time is up let the pot sit there for 10-15 minutes (L0:10) and then move the valve to venting. To make the gravy: Place the meat and vegetables on a platter and set aside. Turn the Instant Pot to the saute setting. Make a cornstarch slurry in a small bowl. Stir together 2 Tbsp of cornstarch and 2 Tbsp of cold water until smooth. Stir the slurry into the pot. Whisk. It should thicken the gravy very quickly. Serve the gravy with the roast and optional vegetables. What if my roast is frozen? You can still make this recipe! Just add 20 extra minutes, so 110 minutes instead of 90 minutes. To make gluten free: Most onion soup mixes are not gluten free. Kroger brand, however, does not contain gluten although it is not labeled as gluten free. Try this homemade recipe and keep it on hand: 1-1/2 cups dried minced onion, 1/4 cup GF beef bouillon powder, 2-1/2 TBS onion powder, 1/2 tsp crushed celery seed, 1/2 teaspoon sugar. 5 Tablespoons of this is about equal to a packet. Like this recipe for Instant Pot 3-Ingredient Rump Roast? Get all my new recipes delivered to your email inbox by signing up below. Sounds good! Been looking for an easy recipe for daughter learning to cook. 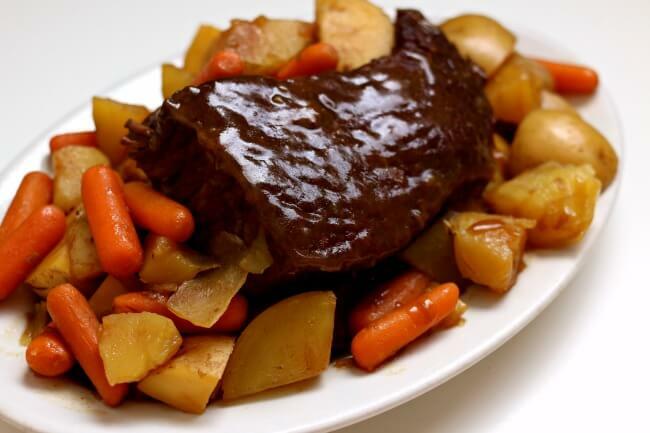 When I crock pot a roast I use red wine as only liquid- comes out heavenly ….Can we do that in an instant pot?? Working away from home for extended periods of time. I’m always looking for something easy to prepare. This meal prepared in an instant pot was not only easy it was awesome! Followed your recipe and had the best meal I’ve had in a long time. Thank you very much!!! I followed to the T and this is a great recipe! I am making it again today. How much time would I do to cook a 1.3 pound rump roast? Instapot! I almost ate the whole roast. Thank You! What if you have a 6 lb roast? I’m new to Instant Pot…thank you!!! I’d cut it in half and double the other ingredients. Cook for an additional 10 minutes. If you are looking for a bottom round roast Instant Pot recipe, don’t look any further. I spent about 30 minutes frantically searching for a recipe for bottom round roast online this afternoon. I had already invited family to dinner and I planned to use my Instant Pot, but every recipe I found didn’t have good reviews. I had almost given up when I found this one. And I’m glad I did. Unfortunately, I didn’t have an Au Jus packet so I ended up using two onion soup mix packets instead. And I didn’t put any veggies in. Now… I really hate not following a new recipe, and I typically refuse to leave feedback in situations when I haven’t followed a recipe. (I really hate reviews like that.) But in this case, I’m going to break my rule. Everyone loved this roast. The roast I used was 2.7 lbs. I was nervous about putting it in for 1.5 hours, but I did it. And then I let it release naturally for 15 mins, as instructed. The middle 1/3 of the roast was a little dry but the outer thirds shredded like a traditional pot roast. The thing I’m not 100% sure of is if that center 1/3, which sliced beautifully and was perfectly fine with some gravy, would have shredded like the rest of it if I had let it go longer. Or if it would have dried out if I let it go longer. Next time I may try it for 100 minutes and do a full natural release…just to see. Hi Trish, thanks for sharing your experience. I bet it would have been perfect at the 100 minute mark!! Or you could halve the roast next time and set it for a little less time. Karen, thanks so much for sharing this. I put 2 roasts in my 8 qt pot, added 3 cloves of garlic and a large yellow onion cut in half. Cooked 90 minutes then added a bag of baby red potatoes and a bag of baby carrots for 8 more minutes. Best roast I have ever made in 30 years. Great gravy from the juice as well. Fresh hot corn bread with honey butter and the family loved it. Thanks again for this wonderful meal. Sounds like a fantastic meal!!! So glad you liked it. This recipe 2-3 lb rump roast is for 90 min. I;m seeing another recipe, Grandma’s Sunday Roast it’s only baked for 30 or 60 minutes. It this due to the different cuts of meat?? 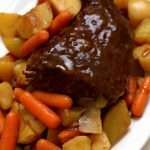 I have tried many instant pot pot roast recipes but this is definitely “the OnE”. my whole family loved it and it was so easy! I took some advise from the comments, however, and only added 1 cup of broth for the cooking liquid and that was plenty. Thank you! I will be using your website again!! Loved it! Made this in my pressure cooker, I don’t have an instant pot. This was amazing. This is only the second recipe I have made in the pressure cooker. I was skeptical of the potatoes having enough flavor, but definitely not issue with this recipe. The husband loved it too. Thanks so much for sharing. Great instructions, great recipe! Highly recommend this one! So glad you enjoyed it Kathleen! This looks amazing!! I can’t wait to try it. All your recipes that I have made have come out great. Thanks. Most Instant Pot recipes call for corn starch for thickening of gravy. Wouldn’t flour work as well? WOW was this good. My kids said it was the best tasting roast they had ever had, and I have made some good ones. The flavor from just two packets is amazing. Too easy. Now we can have a good roast on a weekday. Thanks. What adjustments for. 4.7 pound rump roast? I’d cut it in half or quarter it and keep the cooking time the same. I only have gravy mix not au jus mix hope it turns out okay. I cant wait to try. From my quick search on the internet I think that it will cook similarly. It is a lean and tough piece of meat so the longer cooking time will be good for it, I think. Would I have to make any adjustments to the recipe if I am using a 3.5 lb roast in a 8 qt Instant Pot? natural pressure release. let it sit until the pot releases pressure on its own. Thank you for this great recipe!! Can I put my roast in frozen and if so how much longer would I need to cook it? Hi Kathie, yes you can put it in frozen. I would add 20 extra minutes. 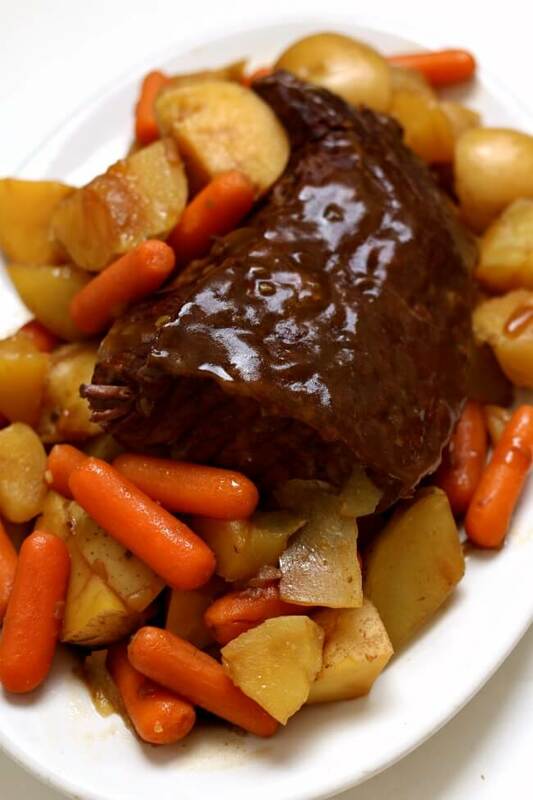 Have you made this using a chuck roast? yes it will work great too! Good job Joseph! That is great. I really want to get a 3 quart. Maybe for Christmas or prime day! This is great to hear Gerda!! Potatoes and carrots version – When the 90 minutes are up, do we use a Quick Release and then add the veggies and cook for 5 more minutes? Or let it NPR for 15 minutes and then continue with your instructions? Do a quick release at 90 minutes. Add in potatoes and carrots. Then add 5 minutes to pressure cooker. Then do a NPR if you have time for best results. I have a 1 and a 1/2 lb. roast. How long should I pressure it for? It probably won’t hurt it to cook for the 90 minutes but I’m thinking you could cut it down to about 75 minutes.